Grains seeing strength in the overnight led by beans. Beans up 9 cents, corn up 2 ½ cents, and wheat up 3 cents. China delivered a written response to U.S. demands for trade reforms, according to government sources on Wednesday. This is a move that could trigger more formal negotiations to resolve the trade war between the world's top economies. Trump is expected to meet Chinese President Xi Jinping at the G20 summit in Argentina at the end of November and in early December. Today’s NOPA October U.S. soy crush seen at 170.026 mln bushels; soyoil supplies at the end of October were projected at 1.521 billion pounds. Wires story reports the global grain market needs more U.S. wheat to make up for tightening supply in other major exporting zones. 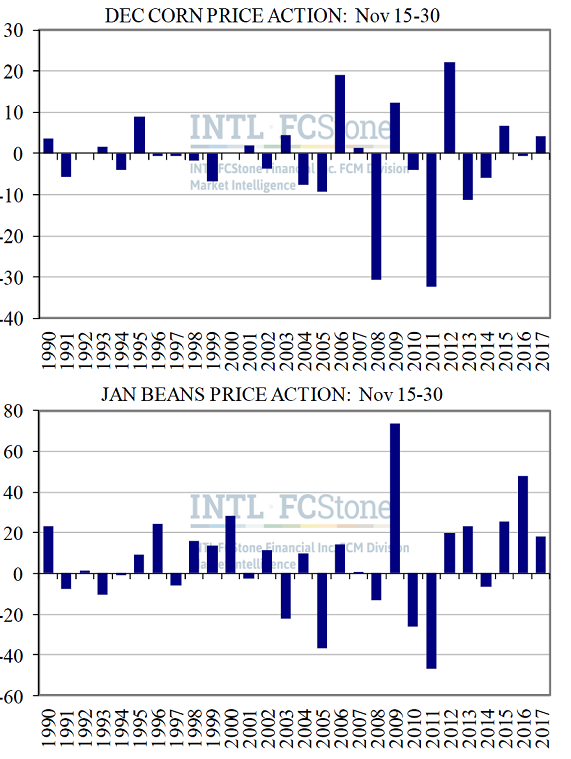 Today’s charts show price action for the spot December corn and January bean contracts, for the remainder of November, since 1990. CZ showed highly varied and sometimes volatile action during this span from the ‘06-13 time frame, consolidating into neutral action ever since (not coincidentally with CZ trading in the $3’s). Jan beans have run more positive during this time, rising in five of the last six years, averaging nearly +30 cents in those five years (including a rally to peak over $10 in early Dec last year).